WASHINGTON –Researchers have developed a new remote sensing instrument based on light detection and ranging (LIDAR) that could offer a simple and robust way to accurately measure wind speed. The detailed, real-time wind measurements could help scientists to better understand how hurricanes form and provide information that meteorologists can use to pinpoint landfall earlier, giving people more time to prepare and evacuate. "As hurricane Harvey approached the U.S., hurricane hunters flew directly into the storm and dropped sensors to measure wind speed," said Xiankang Dou, leader of the research team at the University of Science and Technology of China (USTC). "Our Doppler LIDAR instrument can be used from a plane to remotely measure a hurricane's wind with high spatial and temporal resolutions. In the future, it could even make these measurements from aboard satellites." Wind measurements are also crucial for determining safe flying conditions, understanding how pollution moves through the air and efficiently operating wind turbines. Existing high-accuracy wind measurement technologies can be expensive and difficult to operate, leading to gaps in the application of these technologies in situations where they are most useful. "We demonstrated a Doppler wind LIDAR with a simplified optical layout that also substantially enhances the system stability," said Dou. "Although specialists are typically needed to operate and maintain a sophisticated Doppler LIDAR, we are confident we can develop our approach into a system that will be as easy to use as a smartphone." In The Optical Society (OSA) journal Optics Letters, the researchers demonstrated their Doppler wind LIDAR system's ability to measure horizontal wind speed with high accuracy and showed that the system remained stable throughout a 10-day test period. The researchers say that the stability and accuracy of this new system represents a substantial improvement compared to previously developed direct detection Doppler wind LIDARs. One important application of LIDAR is in aeronautics, where it can be used on aircrafts or from a ground station to remotely measure air motion. With a vertical spatial resolution of 10 meters, the new system could measure small-scale wind phenomena such as wind shear and the wake turbulence created by an aircraft. A better understanding of these phenomena could improve flight safety and also increase airport capacity by optimizing the separation between aircraft during takeoff and landing. LIDAR is a remote sensing method that has been used to create high-resolution maps, scan the bottom of the ocean floor and to guide driverless cars. For measuring wind, a LIDAR system emits a laser pulse that propagates through the atmosphere where it interacts with molecules and aerosols. A small amount of the light scatters back towards the LIDAR instrument, where it is collected by a telescope. When wind causes air to move, this causes a Doppler shift that can be detected by the device. The researchers designed a dual frequency direct detection Doppler wind LIDAR that used a laser emitting 1.5-micron light. Because this wavelength is commonly used in optical communications networks, they were able to build the system using commercially available fiber-optic components, each combining several light-controlling components into a single device. The all fiber construction of the LiDAR system is therefore robust against vibrations and rough operation handling. Compared to previously developed systems, the new simplified design makes it much easier to configure and align each component, increases stability and lowers the amount of light lost within the system. The new system also requires no calibration after it is initialized and requires no special eye protection. 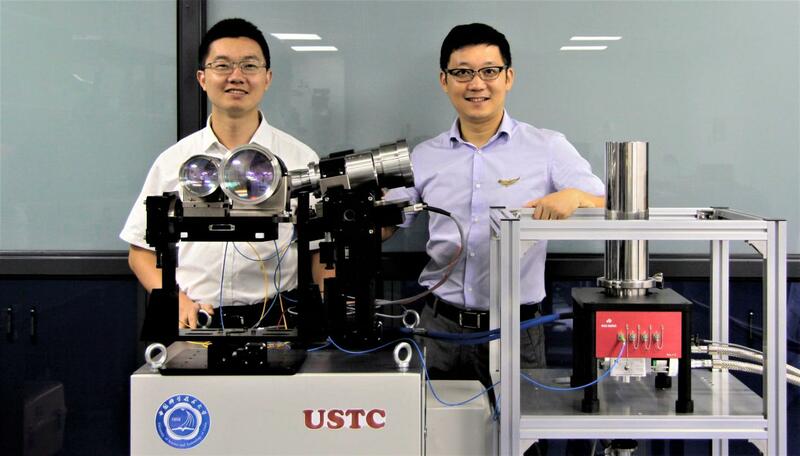 "For LIDAR systems that will be operated full-time in the field, eye safety is an important consideration," said Haiyun Xia, the principle investigator of the Quantum Lidar Laboratory at USTC. "Fortunately, the 1.5-micron laser we used exhibits the highest permissible exposure for eye safety in the wavelength range from 0.3 to 10 microns." The 1.5-micron wavelength is also ideal for atmospheric wind sensing from satellites because, compared to UV and visible wavelengths, it shows less susceptibility to atmospheric disturbance and optical contamination from the sun and other sources. Satellite-based wind measurements are used for weather forecasts and meteorological studies. "Space-borne Doppler wind LIDAR is now regarded as the most promising way to meet the need for global wind data requirements and to fill gaps in the wind data provided by other methods," said Xia. The optical setup for the new Doppler wind LIDAR contains just one laser source, one detector and a single-channel Fabry-Perot interferometer that converts the Doppler shift into photon number variations of the backscatter signals. Using a Fabry-Perot interferometer made of optical fibers rather than one consisting of many individual optical components made the system robust and stable enough to use in harsh environments such as aboard aircraft or satellites. The new system also includes one of the fastest detectors available for single photon counting, a superconducting nanowire single photon detector (SNSPD). This detector improved the LIDAR's performance compared to the InGaAs avalanche photodiodes typically used to detect 1.5-micron light. "The high detection efficiency and low dark count rate of the SNSPD means that the weak signal from the backscattered light can be detected with a high signal-to-noise ratio," said Xia. "Another attractive feature of the SNSPD is its high maximum count rate, which helps avoid detector saturation." The researchers tested their system by first examining its stability after calibration. Overall, the system's measurements varied by less than 0.2 meters per second over 10 days in the lab. They then tested the system outdoors and compared its horizontal wind measurements with measurements from an ultrasonic wind sensor, a non-remote system for measuring wind. On average, the LIDAR measurements were within 0.1 meters per second and 1 degrees for wind speed and direction, respectively. The researchers are now working to improve the spatial resolution of the Doppler wind LIDAR system and want to make it even more practical to use in the field. They have also founded a company to further develop the system and plan to have a commercial version available next year.